Guilford Savings Bank recently awarded scholarships to eight local high school students in the total amount of $22,000. 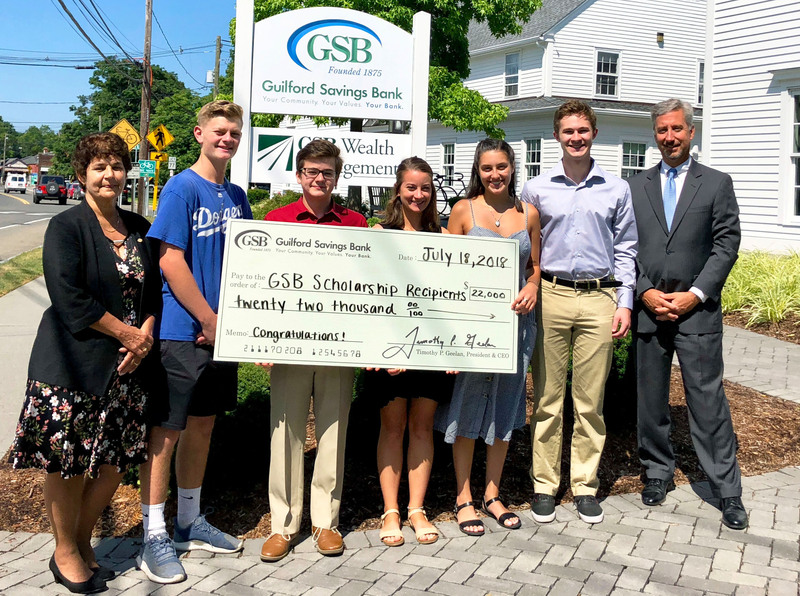 The Guilford Savings Bank Scholarship Program was created to recognize graduating seniors who were in the top half of their class, showed strong leadership qualities, demonstrated a genuine interest in their community through volunteer initiatives and planned to continue their education. The program's recipients are selected by the guidance department at each high school. Pictured Left to Right: Heather Hackley (EVP, Chief Risk Officer), Christian Miller (Branford High School), Gabriel Castro (Old Saybrook High School), Katherine Izadi (Old Saybrook High School), Jolee Fernandez (Branford High School), Tucker Rather (Daniel Hand High School), Lyle Fulton (Chief Lending Officer).